We've given traditional nachos a simple twist! Topped with caramelized apples and cheddar cheese, these cinnamon-dusted baked tortilla chips make a tasty snack for two. Spray both sides of tortilla with cooking spray; sprinkle with cinnamon. Cut tortilla into 8 wedges; place on baking sheet. Bake 8 to 10 min. or until crisp and golden brown. Cool completely. Mix dressing and brown sugar replacement in small skillet on medium heat. Add apples; cook 5 min. or until apples are tender, stirring occasionally. 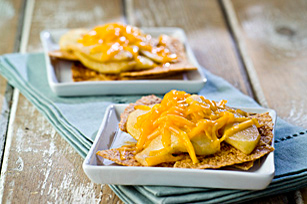 Place tortilla wedges on 2 dessert plates; top with apples and cheese. Serve immediately. Prepare using your favourite seasonal fresh fruit, such as a nectarine, peach, apricot or plum. These nachos, made with better-for-you products, can be a delicious part of your healthful eating plan.